Check out the latest edition of the ANCAPStar. This edition contains the latest ANCAP safety ratings and news from the Australasian New Car Assessment Program. The Australasian New Car Assessment Program (ANCAP) is Australasia's leading independent vehicle safety advocate. ANCAP provides consumers with transparent information on the level of occupant and pedestrian protection and collision avoidance capabilities provided by different vehicle models in the most common types of crashes through its safety rating program. Our member organisations include the Australian and New Zealand automobile clubs, Australian Federal, State & Territory Governments, the New Zealand Government, the Victorian Transport Accident Commission, NRMA Insurance and the FIA Foundation (UK). The Tata Xenon, a recent entrant to the market, has received a poor 2 star ANCAP safety rating due to the lack of electronic stability control. A maximum 5 star ANCAP safety rating was today announced for the new sedan version of the top selling Toyota Corolla. The Peugeot 5008 and Subaru WRX also added 5 star safety ratings to their spec sheets. Launched in Australia last week, the new Mazda 3 again scored ANCAP's highest safety rating - a rating also held by its predecessor. It will launch in New Zealand soon. by HRH Prince Michael of Kent. 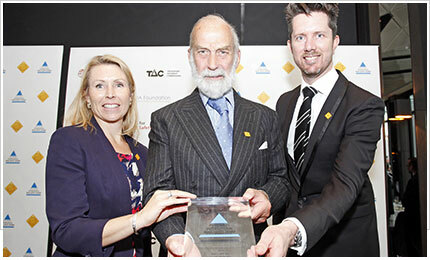 Australasia's independent vehicle crash test program, ANCAP, has been recognised as a major force in improving vehicle safety, awarded the 2014 Global NCAP Consumer Champion Award presented by His Royal Highness Prince Michael of Kent. Two awards were presented to ANCAP - the first, the Global NCAP Consumer Champion Award - was awarded to the ANCAP test program for its dedication to vehicle safety over the past 20 years and its role in fostering the establishment of the ASEAN NCAP test program. The second - the Global NCAP Individual Achievement Award - was presented to six of ANCAP's founding members: Chris Coxon, Michael Griffiths, Jack Haley, Michael Case, Michael Paine and Lauchlan McIntosh for their instrumental roles in the foundation and ongoing work of ANCAP. At the Awards' presentation, Mr David Ward, Secretary-General of the Global New Car Assessment Programme (Global NCAP) said, "ANCAP's support has been invaluable to the successful launch of our newest test program, ASEAN NCAP. ANCAP has also played a pioneering role in fleet safety, encouraging the Australian Government and a growing number of organisations to adopt a 5 star vehicle fleet policy." The Global NCAP Fleet Safety Guide and Safer Car Purchasing Policy was also launched at the Forum and provides guidelines on sourcing safe vehicles in emerging markets where minimum safety standards may not be a legal requirement. Underpinning Forum discussions was the global vehicle safety plight - the greatest current challenge being to see basic regulatory vehicle safety standards applied universally. "Today, passenger cars in Australia, Europe, Japan and the USA are much safer than ever before. This is the result of regulatory 'push' and market 'pull'." "Globally however, of the 65 million new cars sold around the world in 2013, 20 million of these fail to meet the UN crash test standards, have no airbags, no anti-lock brakes, and no electronic stability control." "Mandated standards, combined with consumer demand, have stimulated the production of safer vehicles by the automobile industry in developed countries - the challenge now is to promote similar progress in the rapidly motorising countries," said Mr Ward. Vehicles and Roads of the Future. Held in conjunction with UN Decade of Action for Road Safety Policy & Donor Forum, Global NCAP and its roads equivalent, the International Road Assessment Programme (iRAP), held an interactive workshop on 7 May 2014 to explore how innovation and technology will shape the creation of fatality-free roads. Roads and vehicle experts gathered from around the world at the Fatality-Free Roads Workshop to consider how different road design, treatments, and technologies together with vehicle design and technologies can come together to improve the safety of all road users across low-income, middle-income and high-income countries. The Workshop was facilitated by motoring expert, John Cadogan, with scene-setting presentations provided by John Dawson (Chairman, iRAP); David Ward (Secretary-General, Global NCAP); and Brian Negus (President, ITS Australia). His Royal Highness; Prince Michael of Kent also joined the Workshop to see how roads and vehicles can ultimately eliminate death on the world’s roads. A wide range of solutions were tabled at the Workshop - ones which are already available and ones which we will see introduced in future years. Each of the solutions were then prioritised and their known or likely effectiveness recorded. Full details on the outcomes of the Workshop will be published in a formal report in the coming months. As the requirements for each ANCAP safety rating star level increase year by year, 2014 has seen a number of additional requirements introduced and enforced. 4 x additional safety assist technologies (such as autonomous emergency braking (AEB), adaptive cruise control (ACC), blind spot monitoring (BSM) etc.). The minimum pedestrian protection test score for 2014 has also increased from 'Marginal' to 'Acceptable' for a 5 star ANCAP safety rating. 3-point seat belts, side airbags and minimum pedestrian ('Marginal') and whiplash ('Acceptable') protection scores have also been introduced as mandatory requirements for the 4 star ANCAP safety rating level. From 2014, it is now not possible to achieve an ANCAP safety rating any higher than 1 star if a vehicle is not fitted with ESC. ANCAP recommends vehicles which have been awarded the maximum 5 star ANCAP safety rating. Crash Tests Show India's Cars are Unsafe. The first-ever independent crash tests of some of India’s popular and important small cars have shown a high-risk of life threatening injuries in road crashes. Each of the cars selected by Global NCAP for testing in the frontal impact test at 64km/h received 0 star adult protection ratings. The models tested included India’s best-selling car, the Suzuki-Maruti Alto 800. The Tata Nano, Ford Figo, Hyundai i10 and Volkswagen Polo also underwent assessment. Combined sales of these five cars account for around 20% of all the new cars sold in India last year. Global NCAP chose the entry-level version of each model and as a result none were fitted with air bags as standard. The results highlight major differences in the structural integrity of the vehicles tested. Max Mosley, Chairman of Global NCAP, said: "India is now a major global market and production centre for small cars, so it's worrying to see levels of safety that are 20 years behind the 5 star standards now common in Europe and North America. Poor structural integrity and the absence of airbags are putting the lives of Indian consumers at risk. They have a right to know how safe their vehicles are and to expect the same basic levels of safety as standard as customers in other part of the world." In the Suzuki-Maruti Alto 800, the Tata Nano and the Hyundai i10, the vehicle structures proved inadequate and collapsed to varying degrees, resulting in high risks of life-threatening injuries to the occupants. The extent of the structural weaknesses in these models were such that fitting airbags would not be effective in reducing the risk of serious injury. The Ford Figo and Volkswagen Polo had structures that remained stable – and, therefore, with airbags fitted, protection for the driver and front passenger would be much improved. Coinciding with the Global NCAP tests, Volkswagen has decided to withdraw the non-airbag version of the Polo from sale in India. Because of this, Global NCAP agreed to a request from VW to assess a version of the Polo that has two airbags fitted as standard as from now. Other manufacturers had the same opportunity. The protection proved much better and this airbag-equipped model received a 4 star rating for adult occupant protection. To view the full article and results, go to www.globalncap.org. On 26-27 March 2014, around 7,000 South Australian high school students learnt about the importance of buying a safe car at RAA’s series of Street Smart High events. RAA's Senior Manager - Mobility & Automotive Policy, Mr Mark Borlace provided students with an overview of ANCAP safety ratings - how and why vehicles are safety tested - demonstrating why it is so important for students to consider safety when buying their first car. Students were shown ANCAP crash test footage which showed the different tests ANCAP conducts and highlighted the difference in safety performance between cars with high safety ratings and those with poor safety ratings. As part of this vehicle safety presentation, Volvo showcased the advanced safety features of their XC60, demonstrating the autonomous emergency braking system (AEB) live to the students. The vehicle drove towards a fixed object (an inflatable vehicle) at 30km/h, coming to an independent stop eliminating a collision with the object. Camera footage from within the vehicle was displayed on the event screens to show that the brake was not being applied by the driver. Survey results taken prior to the event showed that 83.9% of students either strongly agreed or agreed that they wanted a car that has good safety features. This rose to 87% when the students were again polled after the event. Street Smart High is an annual road safety education event hosted by RAA in conjunction with event partner the Motor Accident Commission which aims to reduce South Australia’s youth road toll. 5 Star Sales on the Up and Up. The number of 5 star cars sold in Australia has risen dramatically - an increase of 11% on the year prior - with 81% of new cars sold in the first four months of 2014 holding the maximum ANCAP safety rating. From January to April inclusive, 340,000 new cars (passenger, sports utility and light commercial vehicles) were sold, and of these, 270,000 held a 5 star ANCAP safety rating. This significant jump in 5 star sales is a result of a number of Australia's highest selling models - the Toyota Hilux 4x4, Nissan Pulsar, and Mazda 6 - each being awarded 5 star ANCAP safety ratings within the second half of 2013. These models previously held either a lesser star rating or were unrated. In the latter part of 2013, the Toyota Hilux underwent safety upgrades which heightened its safety from its former 4 star rating to the maximum 5 stars. In an earlier edition of the ANCAPStar, a lag in the safety of light commercial vehicles (LCVs) as compared with passenger vehicles was highlighted with 4 star ratings dominating sales across the LCV segment. At the begininning of 2013, the 5 star share of LCVs stood at just 29%. In the first four months of 2014 however this has increased sharply to 57% - the 5 star share now dominating. for Stars on Cars Program. Each year, the Prince Michael International Road Safety Awards recognises the most outstanding international road safety initiatives. In 2014, ANCAP member organisation, the SA Department of Planning, Transport and Infrastructure (DPTI) has been awarded this prestigious award for its SA-focussed Stars on Cars program. "The Stars on Cars campaign has given car buyers the ability to make an informed decision about the ANCAP safety rating of the car they want to buy," said South Australian Minister for Road Safety, Mr Tony Piccolo. "In 2010, 40% of new cars sold in South Australia had a five star rating. At the end of March 2014, this figure had jumped to 71%." Mr Piccolo said that DPTI, ANCAP, the Motor Accident Commission and new vehicle dealerships should be congratulated for their role in the development of Stars on Cars - which now covers all 156 new car dealers in South Australia. 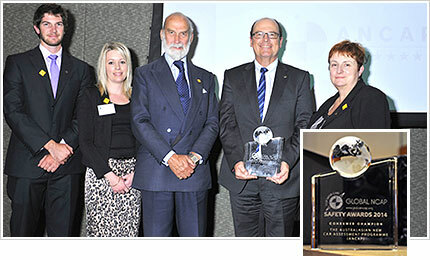 Ms Julie Holmes, DPTI Executive Director - Road Safety, Registration & Licensing and Mr Matthew Leyson, Manager - Safer Vehicles & Technologies were presented with the award by His Royal Highness Prince Michael of Kent in Melbourne on 6 May 2014. For further information on SA's Stars on Cars program visit: www.dpti.sa.gov.au/towardszerotogether/safer_vehicles/stars_on_cars. SAT Explained: Blind Spot Monitoring. Blind spot monitoring (BSM) systems use sensors to detect other vehicles within close proximity, helping to minimise the risk of entering the path of, or colliding with, an unseen vehicle in an adjacent lane due to a "blind spot". Typically this occurs when the car is just behind and to one side of the vehicle it is overtaking. It is a common mistake for drivers to change lanes when there is a vehicle in this so-called "blind spot" - a manoeuvre which causes many crashes. Several manufacturers have developed systems which monitor the blind spot and help a driver change lanes safely. If an adjacent vehicle is detected by the BSM sensors, the driver is provided with either a visual, audible or tactile warning (vibration of the steering wheel). Some systems are camera-based, others rely on radar. Either way, the area to one side and rearward to the vehicle is monitored and the driver is warned when there is a vehicle in a position where it may not be seen in the rear view mirrors. In some advanced systems, the car will steer itself back into the safety of its previous lane. Vehicle safety is the focus of the latest edition of the Journal of the Australasian College of Road Safety (ACRS). Published this month, Volume 25, No. 2, 2014 features articles from crash test and vehicle safety experts around the world. Guest edited by ANCAP Chief Executive Officer, Nicholas Clarke, the papers within the Journal provide an outline of the shift that is occurring with vehicle safety testing worldwide, painting a picture of the international efforts to reduce road trauma and the shift towards vehicle automation. "We're all now well versed on the importance of passive vehicle safety features such as crumple zones, seat belts and airbags which provide protection if you have a crash, but the future of vehicle safety lies with active safety features - safety assist technologies which can prevent a crash from occurring." "Our sights - not only for ANCAP but for vehicle safety testing programs around the world - are therefore trained on technologies which see cars that react before the driver; cars that read the road; and in time, cars that can safely take their passengers from A to B without any driver intervention at all." "While each of our test programs adapts to the changing needs of its market, whether it be established or emerging, we each have the same goal - to encourage manufacturers to build, and consumers to buy the safest cars possible. And, in the not too distant future, this may very well be through fully autonomous cars." To read the full edition of the ACRS Journal, click here. I am interested in the SsangYong Actyon Sport and have seen the ANCAP website lists it as holding a 3 star ANCAP safety rating for models built from 2008. Will ANCAP be conducting a more up-to-date crash test on this model? In general, ANCAP does not re-test vehicle models mid-cycle unless we become aware of production changes which may alter its existing rating. In the case of the SsangYong Actyon Sport, ANCAP is not aware of any significant production changes to this model which would alter its current 3 star ANCAP safety rating. I currently have a 2004 Toyota Landcruiser Kakadu. I am looking to buy a newer Landcruiser (2009 / 2010) Sahara or equivalent and, after reading through your website, it must have ESC, side curtain airbags and be super safe. Can you recommend any cars for me or does the one I'm looking at have this stuff? I have two young kids and I want them to be as safe as money can buy - please help. ANCAP recommends vehicles which hold the maximum 5 star ANCAP safety rating. In addition to performing well in each of the physical ANCAP crash tests, vehicles must be fitted with head-protecting technology, such as side curtain airbags, and electronic stability control (ESC) to earn a 5 star ANCAP safety rating. The Toyota Landcruiser 200 Series Sahara and VX variants built from 2007-2012 hold the maximum 5 star ANCAP safety rating. The GX and GXL variants of the Landcruiser 200 built from 2007-2012 hold a 4 star rating. All variants of the Landcruiser 200 series built from 2013 hold the maximum 5 star ANCAP safety rating, after upgrades were introduced to the GX and GXL variants. Depending on the age of your children, child restraints are also an important safety consideration. For your interest, the Child Restraint Evaluation Program (CREP) provides information and ratings for child restraints available in Australia. You may find this information at http://www.crep.com.au. * Please visit ancap.com.au to check variant / model year applicability. Current ANCAP Twitter Followers include @Danielw_CMF, @CaltexMtColah, @AmandaNStephen and @4WDingAustralia. Follow ANCAP at @ancapcrashtests. © 2014 ANCAP Unsubscribe from future ANCAP emails.